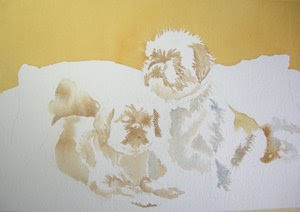 At this stage I am using VERY WET pigments. I want to create light stains to develop some of the variations in value. I used various combinations of Burnt Sienna and French Ultramarine Blue, with a wet-in-wet technique. I applied small puddles of clear water to the areas I wanted to paint, then dripped in the wet pigments and allowed the edges to flow and soften. I worked on a very small section at a time and worked around the fellas so that the previous areas could dry. I looked at my photo references and searched for warm and cool variations and applied them in the corresponding areas on my watercolor paper.